This time around we decided to pay for train tickets; we learned our lesson last time! The train we had intended to take was over 40 minutes late, so we took another train to Bruges, which actually came before our delayed train. 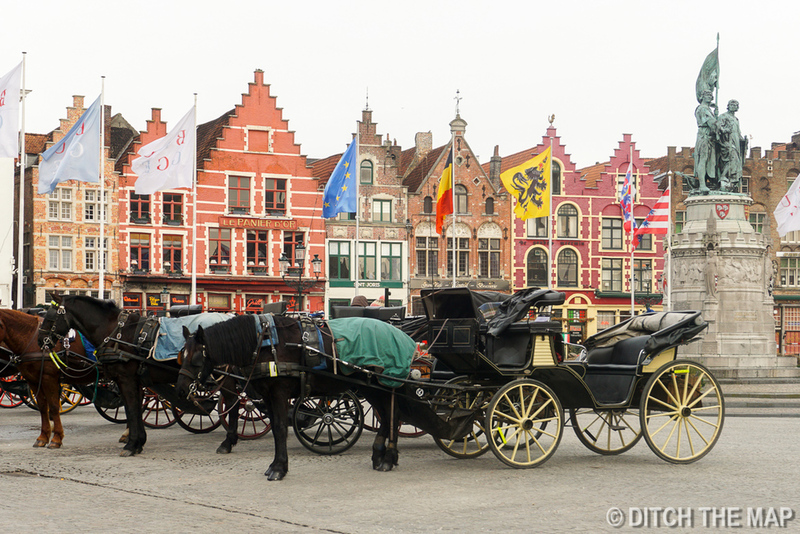 After arriving at the train station in Bruges we walked to our hostel along adorable cobble stone streets lined with charming old buildings. We were both almost immediately in love with the city. 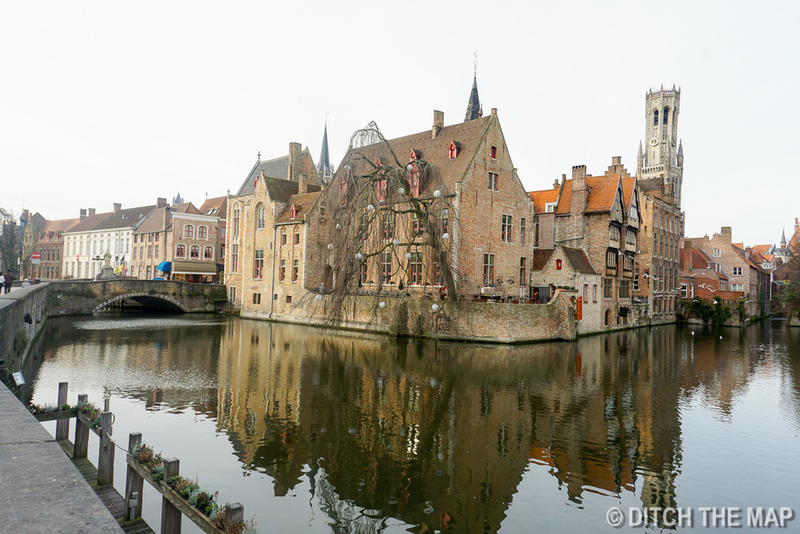 Bruges is such a small city and the historic center where our hostel was located was very quiet. The streets are small and largely pedestrian. It's such a romantic city- a Paris vibe in a quaint town that is much, much smaller and they speak Flemish. Our hostel was located in a large restored historic bundling with high ceilings. Our bedroom consisted of 12 beds in cubby like little cubicles. We rushed out of our hostel to the De Halve Maan Brewery to make our 4pm tour. There was a large group of us on the tour. We toured several floors of the brewery and were able to see the new and old equipment. The brewery has been in use for 6 generations. This is our third brewery tour since arriving in Belgium, and I think our last as well. Essentially, they're all pretty similar. We were able to sample their blond beer at the end of the tour. We left the brewery in search of dinner and were surprised to find that nearly everything was closed. The town must shut down during the winter due to a lack of tourists. We settled for crappy take out Chinese. Back in our hostel we met a friendly Australian, 18 years old and traveling on her own for five to six months. We talked with her for awhile about her travels and invited her to join us the next day to walk around the city. We walked around the city with our new friend. It was one of the coldest days we've encountered so far. The cobble stone streets were like a maze around the city. 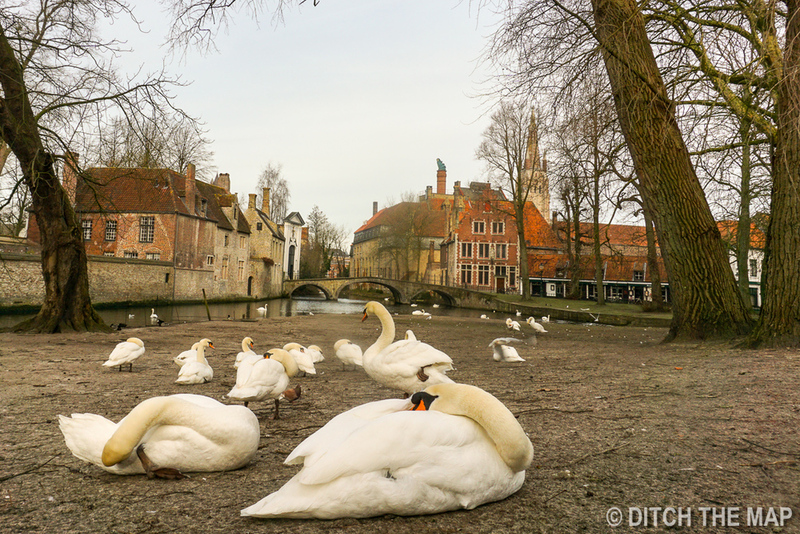 We found ourselves along the river admiring dozens of swans in the water, adding an extra element of romance to the already picturesque city. In one of the main squares of the city we picked up a waffle from a street vender, topped with whipped cream and chocolate sauce. Lucky for us there was no line, but the vender told us that in the summer three separate lines extend across the square and back to buildings! After trying the waffle, I believed him. It was delicious, extra caramelized on either side because of the sugar content. We took a short siesta back our hostel to get out of the freezing cold. We relaxed and let our extremities defrost. Later we set out on a search for mussels- a Belgian speciality. However as we walked around we noticed that just about every restaurant was closed for an extended winter vacation. I guess with the high influx of tourists in the summer they must make enough income to not work in the cold winter months. After much searching, we finally found some restaurants on the perimeter of a cobblestone square. Because of their location we were skeptical that they were most likely tourist traps. We were right. We were quite disappointed with our very over priced food. The mussels in garlic were in a broth of what seemed to be water and we think the fries were originally frozen. We woke up early to walk to the car rental where Scott had found an amazing deal and booked a car for $55 for 3 days. We drove over and around through frost covered country side to reach the cafe of the Westvleteren Abbey. The beer made by Trappist monks here is nearly impossible to get in the states. We entered the cafe and found a short line of men waiting to buy some of the exclusive beer. At 11am in the morning, and hour after the cafe opened, we were already waiting in line- I can't imagine what it must be like during high season with so many tourists wanting to get their hands on the rare beer. We were allowed two six-packs per person, but only one the '12' beer per person. After making our purchase, we sat down at the cafe to try an 8 and a 12 beer and split a panini made with cheese made at the abbey. We drove to St. Bernardus--just down the road--but quickly learned that their gift store had already run out of their oak barrel aged beer. We left without buying anything. We left Westvletern with our 4 six-packs in tow. We safely placed these treasures in the trunk and routed back to Brussels to pick up some Cantillion beer. When we toured the Cantillion brewery a few days earlier we were not aware of what a rarity this beer is. After some research we learned that this beer is nearly impossible to find in the states, so naturally we just had to have some to send back. We drove for about an hour and purchased a variety of their gueze and lambic beers. We walked out of the brewery carrying serval pounds of beer and placed them in the trunk with our others. That's when we realized that we might have a problem. We have a lot of beer to ship home! We were starting to question our shipping options...the cheapest place to ship is Germany but we will not be in Germany for a few more days meaning we will have to lug the beer through Belgium and the Netherlands before we can mail it. We drove what should have been another hour, but was really much longer thanks to rush hour traffic, (did we mention that we don't miss driving?) to a small town to our lodging. Initially we had planned to use Airbnb and we had booked what we thought was a whole house. But, the host had mislabeled the post and was actually going to be at the house as well. We wouldn't haven't paid for the whole house just to share it with a stranger. Needless to say, Scott emailed Airbnb expressing his displeasure and they were actually very receptive and responded promptly. They told us that they would put us up in a hotel close by, put the money we had spent on Airbnb toward the hotel and pay the difference. When we arrived at the hotel however, they did not have a reservation for us. After a long day of driving we were quite frustrated. After emailing Airbnb again and receiving no response we decided to charge the room and have them reimburse us later. at hotel they don't have our reservations. A few hours later we received an email--Airbnb was incredibly apologetic and offered to pay for the hotel in its entirety. Then to top it off, they gave us a $100 credit to use in the future. And, it gets better, they refunded us for our stay with the racist host Belgium! We will definitely use Airbnb again. We appreciate how they take care of their customers. The hotel was amazing! After staying in cramped hostels, it doesn't take much to impress us, but this place was incredible. We definitely took advantage of the pool, sauna and free breakfast. After gorging ourselves on the fee buffet breakfast we set out to Achel Abbey to try some Trappist beer. We drove through more country side for about an hour and found the cafe inside the Abbey that serves their beer. From inside the cafe you could see the equipment used to brew the beer. We tried their brown beer and bought a bottle of their extra blond that you can't purchase in the states. From Achel, we drove to Westmalle Abbey. As you're not allowed inside any of the abbeys, most of them have a cafe where you can sample the beer. Westmalle had a cafe across the street that served food as well and was surprisingly crowded. We sat down and tried the beer sampler, with a blond and brown beer. After enjoying our enormous buffet at the hotel we checked out and drove towards Antwerp. After driving 5 hours over the last several days I am happy that I will not have to do it for another year or so! We explored the town and their main square. I bought a few more hard to find beers and packaged up our box that we will ship home. We went to a post office but they didn't have a scale that would measure a weight over 20 kilos. 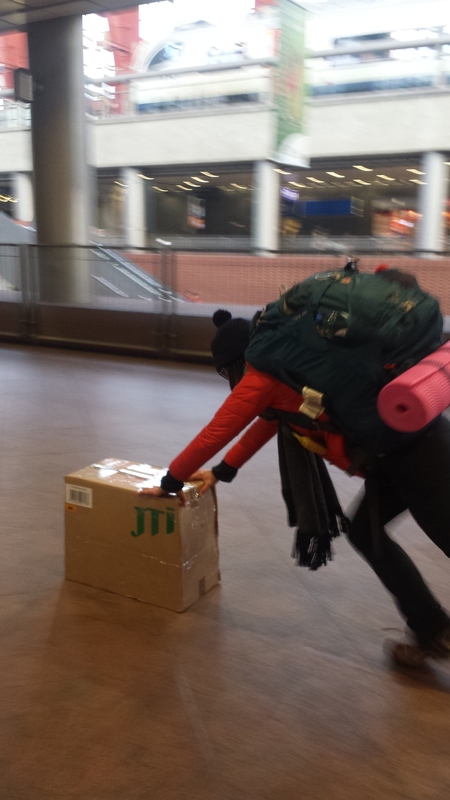 The max to ship was 30 kilos and I wasn't sure how heavy my box was. We were running low on time so we had to carry it with us. I dropped off the keys and we walked to the bus station. The walk was probably a kilometer but carrying the large box, plus my day bag and overnight bag, was extremely tiring. We made it on time to our bus but learned quickly that our bus was delayed. It actually never came and we had to wait for the next but, which was 1.5 hours later.